It's not bad, but certainly not as functional as I'd like it to be. I saw this pin for a skillet organizer and knew I had to have one. For only $9.00 at Lowe's, it's definitely a bargain. The skillet organizer fits in the corner of the cabinet. It also comes with screws to anchor it on the shelf. I didn't even bother screwing it in and it works just fine. It has a plastic coating and doesn't slip or move around. 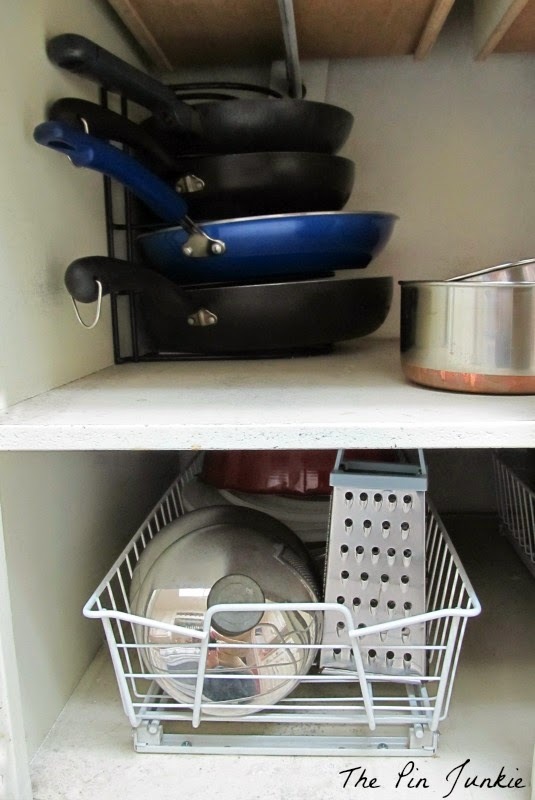 Each skillet fits on it's own little shelf and is nicely organized. Now I can just pull out the skillet I need without having to move all the other skillets out of the way. As a bonus, the non-stick coating on the skillets doesn't get damaged from scraping on the other skillets! Plus, I'm a neat freak and seeing things nicely stacked and organized just makes me really happy! The white wire racks on the bottom shelf are something I installed when we first moved into the house. They are absolutely fantastic because they pull out and help you reach things on the very bottom shelf in the back of the cabinet. You don't have to be down on your hands and knees to get something. 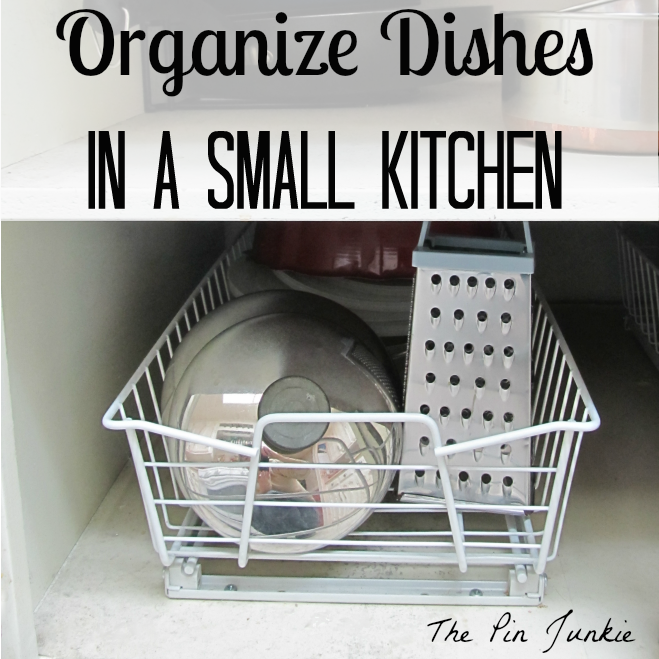 Find even more organizing tips here! Inspired by this pin for skillet organizer. I have the same problem! No storage and it is musical pots every night for dinner. LOL! "musical pots . . ." I love that! I love your tips and ideas!!! I need this! I hate stacking my pans on top of each other, I love your skillet organizer! 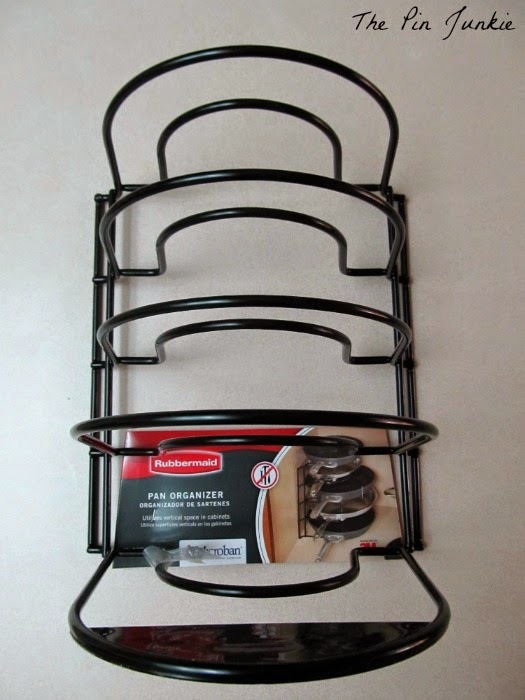 I've been meaning to buy a dish rack for that very purpose, thanks for sharing your tips via Mommy Monday! 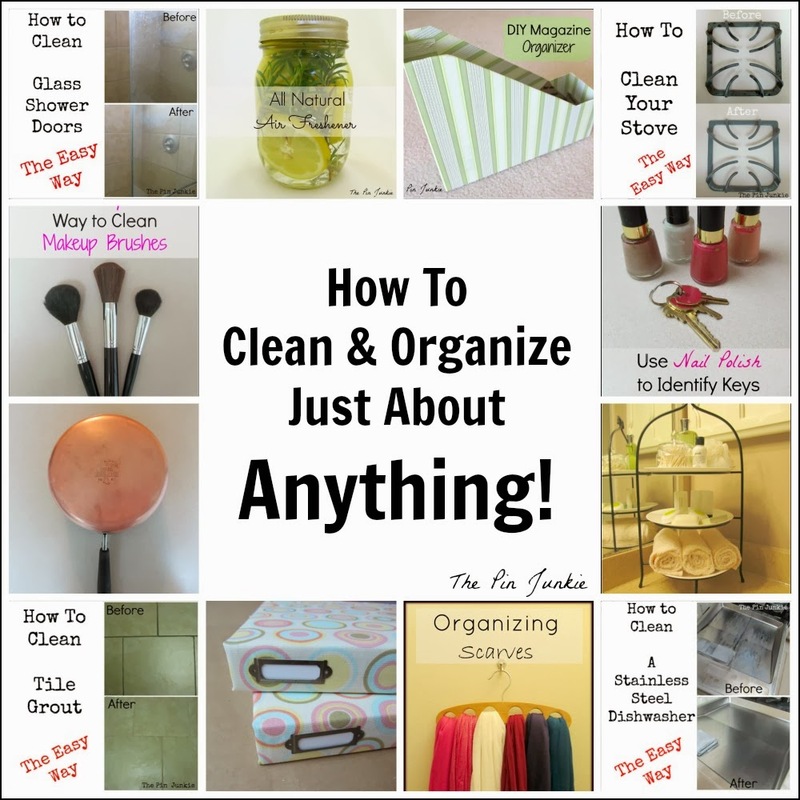 Thanks for sharing, these are really great organizing tips! I use these organizers. They are great. There's always a solution! My grandmother had a sliding tray in her cabinet, it kind of looked like a dishwasher tray - she used it for all the lids to her pots. 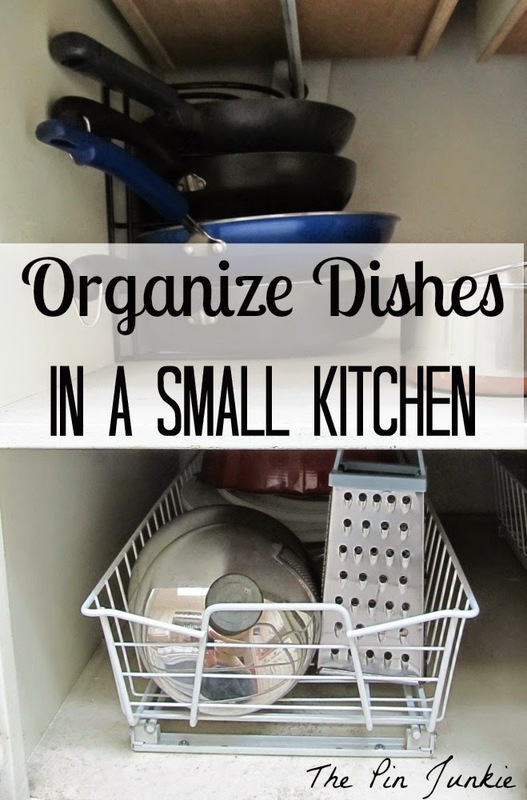 I'm totally doing this, lids, pans, and storage containers are the hardest things to organize. Pinned! Thank you for sharing at Treasure Box Tuesday. Wow, I've never heard of such a product! Love this idea! You should see what I look like trying to shove my pots inside and getting the door to stay closed before slowly backing away. It's madness! I'm going to hunt for one of these for my cabinet! I found mine at Lowe's! Ah! 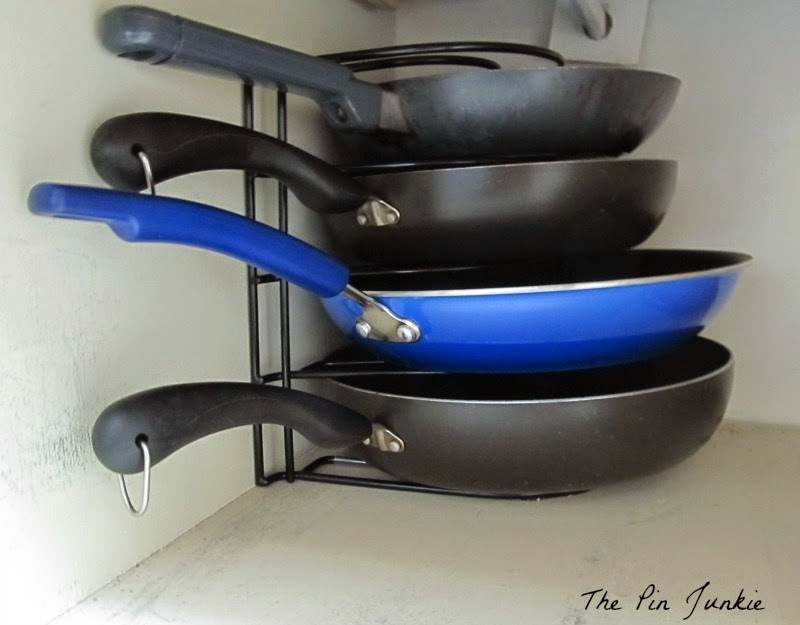 I am so buying one of those skillet organizers! Genious. Thanks so much for sharing your tips and for linking up at the Sunday Soiree. These ideas could Change. My. Life. Thank you for sharing this at Brag About It Link Party on VMG206, Bonnie! OMGoodness...I needed to see this soooo bad. This will certainly come in handy, and I Pinned this as a reminder. I can't tell you how many times something has fallen or almost fallen out of our kitchen cabinets. That is a cool rack. I never have enough space in cabinets. I keep buying gadgets and pans! I found you on Simply Dream & Create's link party, and I'm SO glad I did. Our kitchen isn't small, but we definitely don't have a lot of cabinet or counter space. This is just such a great idea! Thank you so much! 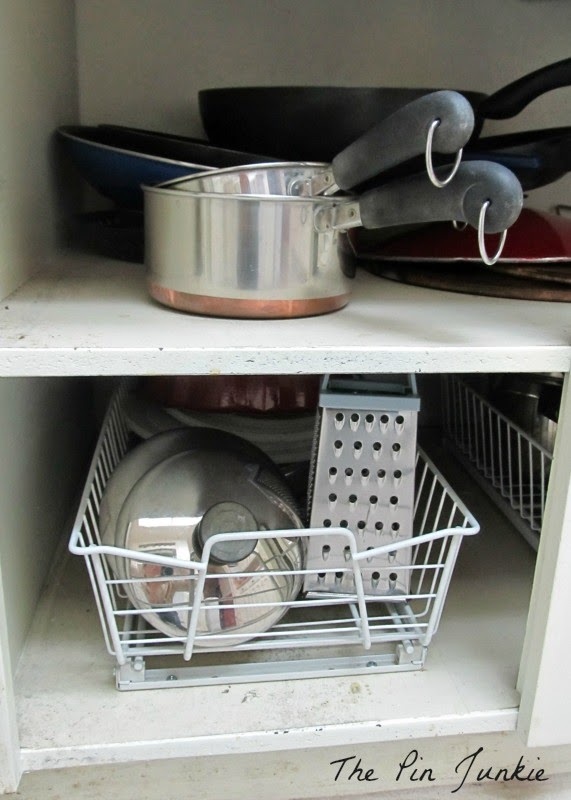 What a fabulous solution to better store those pots and pans! Thanks for linking up! What a great way to organize your skillets! I'm going to have to look for one of those, if only to spare myself the noise of pulling one pan out and having the other clatter around. I hate that sound! Neat tips!! 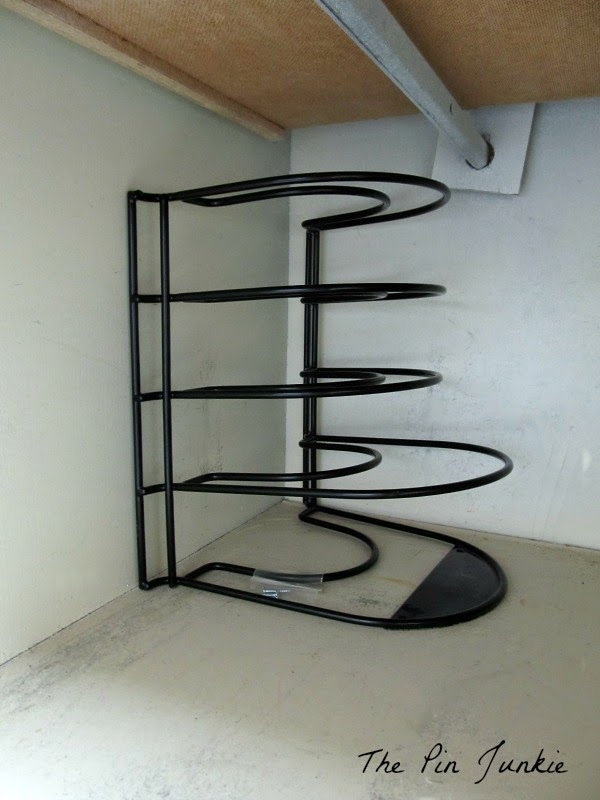 I should get something like that rack. Thanks for linking up at Take it on Tuesday! Thanks for your vote Theresa! I appreciate it! I hang my skillets up on cup hooks I screwed into a wooden dowel I hung over the stove.